Albert Chen worked as a game design director, level design manager, and senior level designer at Factor 5. Some of his tasks involved assistance in designing AI behaviors, tactics and, online multiplayer gameplay for certain projects. The games he worked on included Star Wars Rogue Squadron II: Rogue Leader (GameCube), Star Wars War Squadron III: Rebel Strike (GameCube), Lair (PlayStation 3), as well as an unannounced project that ended up being cancelled. Before working at Factor 5, he was involved on many games for LucasArts which can be seen on his official website. We would like to thank Albert Chen for taking the time from his busy schedule to do this interview with us about his time spent at Factor 5. As a game design director at Factor 5, you organized and managed two design teams on two concurrent projects (one of them being “Lair”). What type of challenges were involved in managing two teams at one time, and what type of qualities did you look for when hiring new designers onto the teams? Between the release of SW:RS: Rebel Strike and Lair, the design team grew from 6 designers to 14 at the height of Lair’s personnel ramp up. Two of the veteran designers went off to work on an unannounced project that never got published while the rest of us moved forward with Lair. The hiring process was one of the first big challenges I had because at Factor 5, designers wore many hats. We not only designed and implemented the levels, we also wrote voice lines, created game assets and helped to define improvements and modifications to the design tools. Essentially, we looked for designers who were self-starters who took the initiative and were always able to adapt to constant changes and challenges. Another challenge I faced was trying to maintain the second project’s autonomy and independence. Whenever you have two or more concurrent projects in development, it is very tempting to drag resources from one to help another, esp. when major deadlines appear. However, if you get the habit of doing this on a regular basis, the “lesser project” looses momentum and that team’s morale drops. It was a constant struggle during Lair’s development. This eventually happened and Lair sucked everyone in. Currently, you are an assistant professor at the Cogswell Polytechnical College. What type of courses do you teach, how long have you been teaching, and do you have any advice for young people who are interested in a career in game development? I teach courses dealing with game design, level design and game production. I also run a course called “Game Studio” which brings together students from different disciplines to make a game as a development team in a studio environment. That means they have to go through many of the trials and tribulations that game developers face in industry. It’s a great way for students to test drive one or more development roles before they graduate. I think most people who think they are interested in a career in game development misconstrue their passion for PLAYING games with MAKING games. Game development is hard work and to be good at it, you have to practice constantly. Luckily tools for game creation are easy to find and most are free to try or use indefinitely (with some restrictions dealing with commercialization of course). That means there is no excuse for not making a game, whether you want to be a designer, artist, programmer, etc. You helped organize, track, and prioritize schedules for projects and teams. What are the most important things needed to keep a game’s development on schedule? I think the number one thing that will make or break your game is whether you have a laser-focus on what game you’re building. For SW: RS2, we completed development in about 9 months, in time for the Nintendo Gamecube launch. If you look carefully at RS2, the game mechanics were mere refinements over the original. What took the greatest leap was the graphics which really pushed the Gamecube hardware. We also anchored the game’s story and levels to the classic Star Wars trilogy so everyone knew exactly what the game was going to be like. Lastly, our mantra throughout development was “fantasy fulfillment”. If what you were working on didn’t support or make you feel what you felt when you watched the classic trilogy movies, you were working on the wrong thing. All these elements helped the team focus its efforts on giving fans the truest Star Wars experience in a video game. 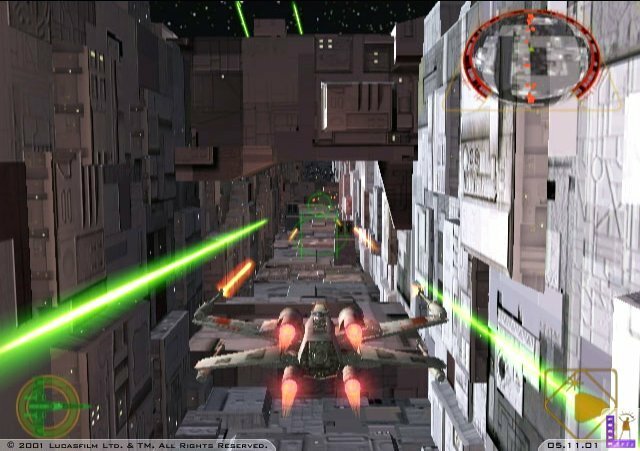 Describe the work involved in designing, implementing, and scripting levels for Rogue Squadron II: Rogue Leader and Rogue Squadron III: Rebel Strike. With Rebel Strike, you had levels with both vehicles and on-foot missions. At Factor 5, we used a level editor called L3Dedit which was a proprietary level editor from LucasArts. It evolved over time as we added new functionality to it for each title we worked on. In the original RS, moving objects were stuck on splines which were not rendered in game. That means that all the spacecraft and vehicles were running on tracks and their movement was controlled by adjusting elaborate spline networks. During RS2, we were able to attach objects onto splines and then script them to leave and use a free-roaming AI. By the time we got to RS3, we were using mostly free-roaming AI and splines were relegated to situations where the designer wanted pinpoint control of a level object’s movement. For RS2, we used the major movie battles as narrative anchors and graphical set pieces for the main campaign. I worked on the attack on the first Death Star which was the first level in the game and the space portion of the Battle of Endor which came near the end. The Death Star Trench run was my homage to the classic Star Wars vector graphics arcade game. The physical obstacles and the crazy speed in the trench added to the tension and excitement that replicated the feeling you got when you saw that sequence in the theater. For the Battle of Endor, I really wanted the player to relive the entire sequence so the beginning of that level is fully interactive instead of a cutscene. I used the Millennium Falcon as a visual cue for the player to follow until Admiral Ackbar says “It’s a Trap!”. The Falcon and all the big Rebel capital ships were on splines which had a U-turn. That’s how I was able to get all the Rebel ships turning around in perfect formation. I also threw in the maximum number of spacecraft the game engine could handle because I really wanted the player to feel the epic scope of the battle. During RS3’s development, we knew that we had to add some new things to the sequel so that’s where the ground vehicle and character combat came in. The character combat borrowed cinematic camera work from the “Devil May Cry” series while the shooting mechanic came from twin joystick arcade shooters such as Robotron and Smash TV. The problem with the character combat was that the mechanic didn’t jive with the Star Wars universe. You never saw Luke mow down a thousand stormtroopers with his blaster. Also, the twin stick shooting controls didn’t really work well with a cinematic camera which frustrated players. Did Factor 5 make any new attempts at rebooting their Turrican series for modern consoles (Wii, Xbox 360, PS3) before they were shut down? I ask specifically about this series because Turrican was a property that Factor 5 owned themselves and not a property owned by LucasArts/Nintendo/Sony/Electronic Arts. We had some early talks with Microsoft about doing something for the Xbox/360 around the time of the Lair proposal, but nothing specific ever happened that I was aware of. I think Turrican was always mentioned when it was time to come up with game proposals. What’s the process like in creating game proposals and pitches with lead game designers? What type of things would a publisher likely see in a game proposal or pitch from Factor 5? Which publishers received the most game proposals/pitches from Factor 5, and are you allowed to talk about any of the proposals/pitches that were never green lighted by publishers to go into actual development? The process usually stared out in brainstorming meetings with the design team, the art director, producer and the President of Factor 5. Then the design team would go off and flesh out the ideas into one page proposals. We would also do competitive analysis on games of similar genres. We sometimes also made quick prototypes or animatics based on game ideas and the ones people gravitated towards would be chosen for further development. Not sure which publisher got the most proposals from us, but we had a long relationship with LucasArts and Nintendo. As for cancelled games, I don’t want to get into specifics for the ones that aren’t mentioned anywhere on the internet. For example, we pitched a RS game viewed from a different perspective to LucasArts before Lair. The game that was being developed during Lair was an interesting take on some of the strengths of RS2 and RS3 with a unique graphical look. As for games I can comment on, there was Thornado which was supposed to be a spiritual successor to Turrican. That was worked on during RS2 but ultimately scrapped. I remember one of the designers making a really nice model of a damaged Golden Gate Bridge. Of course, the last game that Factor 5 worked on was a Superman game for Brash Entertainment. You can find a video proof of concept on Youtube. Today, many studios are shut down due to game development costs, rising budgets, and longer development times. With graphics becoming more and more realistic every generation, do you see budgets increasing beyond what most studios can support? Did this play a big role in Factor 5 shutting down, and could it lead to more studios shutting down in the future? Factor 5 followed a more traditional business model and was a victim of the financial crisis. Their last publisher went under and they couldn’t secure what is called a “bridge loan” to keep the company open while they were trying to land another publisher. Game development can be very expensive and risky, but I think we can see many alternate ways to develop games these days. Just look at the success of games like Minecraft, Day Z, League of Legends, Tribes: Ascend, to name a few. I think there will always be the big blockbuster AAA games like a Call of Duty or Halo. That said, I think there will be fewer of those in the future because they are so costly and risky to make. Did the Lair team at Factor 5 find it difficult to develop for PlayStation 3? How did developing for PS3 compare to developing for the GameCube or Wii? We were one of the first dev teams to get a PS3 dev kit and Factor 5 pioneered a lot of the technology that would help other developers. PS3 was powerful IF you were able to take advantage of the hardware but like the PS2, it wasn’t initially developer friendly. Gamecube was a bit easier, but the dev kits were very expensive when we were working on RS2. We only had 2 dev kits for 25 people to use. The Wii is essentially an upgraded Gamecube. Lair was released to some mixed reviews. Some critics really liked it, and some didn’t. What features did you like the most about Lair? Would you have changed anything if Factor 5 was given more time to work on the game? I think Lair suffered from lack of design focus. There were multiple stakeholders who had their idea of what the game should be and there was too much jockeying for position and not enough actual focused design. The inclusion of the sixaxis relatively late in the development cycle didn’t help and the exclusive sixaxis control scheme that shipped with the game definitely alienated our core audience. The physical attacks were interesting, but I think they would’ve benefited from more development time. Ultimately, I’m not sure if the game would have been a better game unless the sixaxis support was reduced dramatically or thrown out. Factor 5 always pushed the GameCube’s hardware to its limits. The Wii was more powerful yet a Nintendo GameCube launch title like Rogue Squadron II: Rogue Leader looked better than most third party games on the Wii. Were third parties lazy in pushing the Wii’s graphical abilities, and what could they have learned from Factor 5’s games on GameCube? I can’t really speak for other developers, but I’m guessing that it all comes down to economics. Unless you were a first party, launch title or established sequel, you couldn’t really justify spending too much on development because you were not likely to sell very many units. What was the relationship like between Factor 5 and Nintendo through the years? In 2003, when Rebel Strike was being shown at E3, Nintendo’s Shigeru Miyamoto said Factor 5 was working closely with Nintendo on another game for GameCube. All of a sudden, Factor 5 moved on to work on Lair for PlayStation 3 with Sony publishing it. What forced Factor 5 to leave that project to work on Lair? Factor 5 had a very good relationship with Nintendo until the Gamecube started losing the console wars to the PS2 and Xbox. There were some discussions about working with Miyamoto, but most of the dev team was in the dark. I wasn’t privy to the financial negotiations between Factor 5 and Sony, but I’m guessing that it all came to money and leveraging off the success of the PS2 and the high expectations of what the PS3 was going to be able to do (at that time). There was a rumor that one of Factor 5’s Wii projects was completely done (or very close to completion) but Nintendo passed on publishing the project. Is there any truth to the rumor, and how involved was Nintendo on the project’s development? For the two Wii titles published by Nintendo and LucasArts, how far along in completion (percentage % wise) were each game before Factor 5 went defunct? Did either of the projects start development on GameCube before being moved to the Wii? I left Factor 5 before they started work on Wii titles so I don’t have any information about this. Nintendo has a virtual console service for the Wii and Wii U where you can play older games from past consoles, including the Nintendo 64. When the Wii U comes out, would you like to see Factor 5’s N64 games on the service? Also, would you like to see Nintendo make GameCube games available on the service when Wii U launches so a new generation of gamers can play Rogue Leader and Rebel Strike? Absolutely! I would love to have a whole new generation of gamers play the games that we worked so hard on. I’d love to see a 3D version of RS2 on the 3DS. How cool would that be?!!!!! Factor 5’s demise became very public in the gaming community in 2009. Were employees furious in how the top management at Factor 5 handled the situation and treated employees? The founders had started another company called “TouchFactor”. From what I’ve read, they still owe Factor 5 employees money but will never be liable to pay since they declared bankruptcy (although employees were promised they would be paid). I wasn’t there when the company was going through bankruptcy, but I had some friends who were working on the assumption that they would be paid once a publishing deal was done. That of course never happened and I heard that some of the employees filed a lawsuit against Factor 5 management. There was a lot of interesting backroom drama and I hope that someday, it’ll be safe to talk about it. I think it would make a great book or movie!